Repetitive stress syndrome * occurs when doing something over and over again causes pain, muscle strain, inflammation, and possible tissue damage. Repetitive motion problems, also called repetitive stress injuries, are the most common form of occupational (workplace) illness. As a member of the high school tennis team, John served with accuracy and overwhelmed his opponents with his backhand. He worked harder and practiced more than any other team member. Major college scouts were looking him over. During a major tournament, however, John felt pain and swelling where the tendons join the bones at the elbow. His repeated practice of straightening elbow and extending wrist—especially with his mean back swing—had caused small tears in the tendon and muscle. The doctor diagnosed epicondylitis (ep-i-kon-di-LY-tis), a classic case of "tennis elbow." Tennis elbow, runner's knee, and writer's cramp are common names for repetitive stress injuries (RSIs), which result from repeated movements that stress the tendons, ligaments, joint capsules, fascia (FASH-ee-a), and other soft tissues that surround or attach to muscles and bones. Repetitive stress injuries can cause inflammation * of the neck, shoulders, arms, wrists, hips, legs, and ankles. In 1964, at age 36, Leon Fleisher was one of the world's great pianists. When he noticed a weakness in the little finger of his right hand, he practiced harder to overcome it. During the following 10 months, however, the other fingers in his right hand curled under until he was unable to play piano at all. In 1995, Fleisher began physical therapy and deep tissue massage, which taught him how to "de-contract" the overused muscles in his right hand. In 1996, he was able to resume playing concerts with both hands. Carpal tunnel syndrome affects people who overuse their hands on piano or computer keyboards. The doctor's physical examination and medical history usually will reveal the repetitive motion that has stressed the soft tissue and caused the injury. The doctor may recommend x-rays or blood tests to rule out other causes. 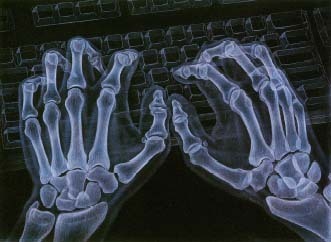 Office workers who overuse computer keyboards are at risk for repetitive strain injury. © 1994 T Buck/Custom Medical Stock Photo. U.S. Centers for Disease Control and Prevention (CDC), 1600 Clifton Road N.E., Atlanta, GA 30333. CDC posts an Occupational Health fact sheet at its website and provides a link to NIOSH. U.S. National Institute of Arthritis and Musculoskeletal and Skin Diseases (NIAMS), Building 31, Room 4C05, Bethesda, MD 20892-2350. NIAMS posts information about shoulder problems at its website. U.S. National Institute of Neurological Disorders and Stroke (NINDS) posts information about repetitive motion syndromes and carpal tunnel syndrome at its website. American Academy of Orthopaedic Surgeons (AAOS), 6300 North River Road, Rosemont, IL 60018-4262. AAOS posts patient education fact sheets about shoulder pain and carpal tunnel syndrome at its website. The Arthritis Foundation publishes brochures and posts fact sheets about many different kinds of soft tissue rheumatism at its website. American College of Rheumatology, 60 Executive Park South, Suite 150, Atlanta, GA 30329. ACR posts a fact sheet about tendinitis/bursitis at its website. Association for Repetitive Motion Syndromes (ARMS), PO. Box 471973, Aurora, CO 80047-1973.